This relates back to the conveying emotion post. One of the most common writing rules that writers will hear is “show don’t tell.” I’m not particularly fond of hard and fast rules, but this is a time where that can be very useful. Emotion is a key part of any story, and conveying that in a way that’s meaningful to readers can be difficult. That’s where body language comes in. Just as it is a natural way to communicate both conscious and unconscious feelings and attitudes in real life, it can be used in our writing too. Body language gives away a lot of information without a single piece of dialogue. Let’s break this down, shall we? Firstly, we have the broad use of body language and how that relates back to the character’s species. For example, a predatory creature (such as werewolves) will view strong eye contact as aggression; an alien race, however, say one that can read minds when eye contact is made, could see it as a sign of honesty and openness. Next, we have the character’s position within the dynamic at hand. If someone stands over another person, they are establishing dominance over them and controlling the dynamic. Is your character dismissive of this? Do they submit? This gives insight into their personality and those around them. Then we have the relationships and potential relationships that are displayed through body language. Did George just run his finger over the back of Dave’s hand? That very small gesture could say a lot of things about their relationship. It could be that they’re an established couple, they could be hiding a relationship, or George could be hoping to initiate one. Finally, we have the actual emotions and reactions displayed, which again says a lot about the characters at hand. If Cindy has been poker-faced and completely unfazed up until the mention of the word ‘Selene’, upon which she clenches her fists and tightens her jaw, then you know there’s something there. First up we have the broad strokes that tell us a little bit more about the character’s species. This is far more applicable to speculative fiction, as they’re more likely to have non-human characters. We’ll take the classic wolf shifter as an example. They will have body language that relates back into their wolf side. For example, a particular awareness of eye contact, dominance and submission displays, marks of territory, and a keen eye for signs of aggression. These could come across as displaying wolf-like behaviours while in their human form, such as baring of the teeth, intense eye contact, and raising of the head to display the throat. All of that information and those little cues can then go into the writing to add to the plot and character development. The main character could be a fae who despises the overt aggression and territorial nature of werewolves. That could be mentioned as a reaction to one baring its teeth at him for stepping foot in what the werewolf perceives to be its territory. That gives a little insight into the character and potential for further conflict. Another example of where species-specific body language and interpretation would be where one species is trying to blend into and pass as another species, but they don’t understand the finer points of the body language, so they get caught. Or conflict could ensue due to a misunderstanding – see the eye contact point earlier. Now we can look into how body language shows the character’s position within the dynamic at hand. For more information on dominance displays read this post. This is again species specific and could be tied back into the points above with regards to confusion and misunderstandings. Generally speaking, the character that is bigger than the other is the dominant party. Daniel scurried into the boardroom, the hot coffee mug burning his hands as he prayed that he’d put in exactly the right amount of sugar. He kept his eyes low and placed it carefully on the purple placemat, exact centre, hand facing directly northeast. He gulped and edged away to the far corner as she entered the room. Her eyes flicked around the empty room before they settled on the coffee, a small smile flickered across her lips. Daniel didn’t dare allow the relieved sigh to escape as his shoulders relaxed a little. That’s a pretty extreme example, but it shows the fear quite well. You’ll notice that the woman had no time or energy for Daniel; he was beneath her. He wasn’t worthy of her focus. That gives insight into her character and the dynamic. Relaxation of the muscles, particularly facial muscles, while in proximity. Placing themselves between their partner and other people, particularly potential rivals. These can be used to show the health and state of the relationship. Did Loren and Larry start their relationship with lots of touching, but now Loren gets tense every time Larry tries to touch her? Does Larry’s gaze wander away from Loren during intimate moments? These are all little clues that something’s wrong. On the other hand, if Zara starts moving closer to Mark, and Mark reciprocates by giving her more focus and attention, then there could be something starting there. There are other forms of relationship though, such as a boss and an employee, friends, co-workers, and family. Tension, eye contact, proximity, posture, and tone of voice can all be used to display the health and status of those relationships. 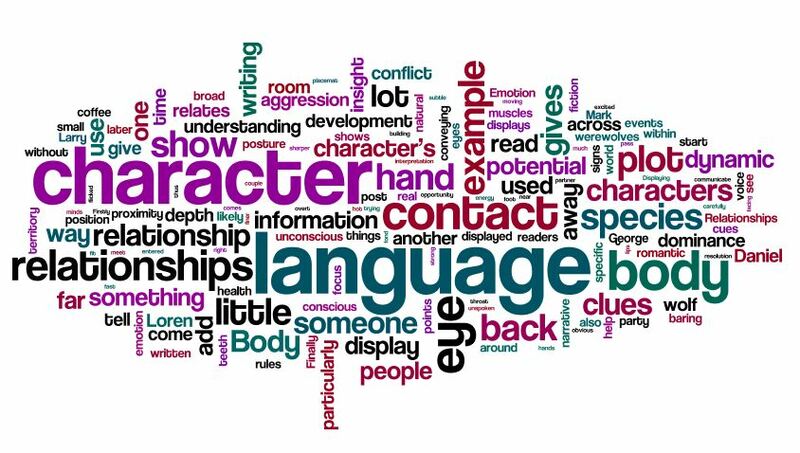 That unspoken understanding can then help character development, introduce or remove secondary characters, and move the plot forwards through conflict and resolution. Relationships are very important to people and thus characters; use them to add depth and meaning to the plot. Finally, the most simple and obvious use of body language in writing is to display emotion. It could be an unconscious display such as shifting the weight back away from someone the character doesn’t want to be near, which could then be a clue into further things. Or it could be a far more conscious thing such as a large grin and opening of the arms to greet someone. Rather than having the characters say or even think that they are sad, worried, joyous, nervous, excited, etc., have them show it. That allows for smaller details and hints to come in too, all of which add more depth and can be clues to later events in the plot. Those clues give the readers something more to enjoy and help the complete immersion into the plot. Body language is a natural way to add in a lot of information in a more subtle way that adds layers and depth to the narrative while also having potential to aid character development and world building. It helps the reader become more immersed, because rather than being told that someone is thinking or feeling something, they can read into the actions and decide for themselves, much more like the real world.